Happy start of April, felinity assembled! Anyone out there? We are going to be returning to regular blogging, soon, I promise! National Poetry Month 2019 is Here! Challenge Yourself! Write, Don't Nap and Snooze! Yeah, I know...WTM? Where the hell y'all been, girl? Let's just say the months since Daddy Kiril returned from the Cat Writers' Association Conference have not been the best for him, but we are all hanging in there...He and us have been in a bit of a creative funk that we are all slowly, finally, coming out of, so we hope you let us know what you think as we begin to move forward. Happy April Fool's Day, felinity assembled! It has been 9 years since our beloved Mr. Nikita last wrote about it, and wrote a poem based on a prompt. This is no joke, but a very serious, vey popular, month of the year for those with the creative spirit in them, both human and critter, alike. National Poetry Month was established by the Academy of American Poets, in 1996, as a month-long, national celebration of poetry. The concept was to increase the attention paid-by individuals and the media—to the art of poetry, to living poets, to our poetic heritage, and to poetry books and magazines. In the end, its founders hoped to achieve an increase in the visibility, presence, and accessibility of poetry in our culture. National Poetry Month has been successful beyond all they could have hoped and has grown over the years into the largest literary celebration in the world. Elvira, Friday and I hope this post will encourage you and your human to read poetry, and even write poetry of your own. You may think you don't have it in you to write a poem, but you would be mistaken. I discovered my own talent for poetry, and have been writing them ever since. So did Elvira & Friday. Happy New Year, felinity assembled! Let me begin by stating that any resemblance to 3 felines of your acquaintance, in this story, is PURELY coincidental. War was declared at high noon, a victor declared by 3. The cats all liked to snooze on the bed. To stretch out their full body length and relax for an afternoon nap while daddy was at work was pure bliss. Usually one would think of it before the others and that was that. New Year’s Day was different. They headed for the bed as soon as daddy left. One tuxie at the head of the bed, one at the foot, the tortie in the middle. After a few hisses and cranky meows each walked in a circle, curled up in a ball, and settled down to wait. 2 came and a tuxie had to pee. As soon as she left the bed the tortie stretched out toward the pillow and sighed in happiness. The other tuxie, as usual, having ate its fill at breakfast AND drank from the water bowl before and after, found it impossible to keep from doing what came naturally and finally had to go take a dump. By 3 it was over. 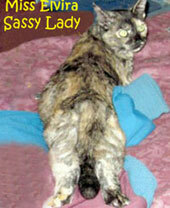 The tortie, victorious, stretched lengthwise across the bed and smiled. It paid to slowly chew her kibble and drink sparingly through the day. An important Public Service Announcement valid not just on New Year's Eve, & Weekend and Chrissymouse Eve & Day (Catmas for those in Rio Linda), but any Holiday, and really ANY day. If posted on your blog, share a link to this blog. Yappy Hew Near, felinity assembled! 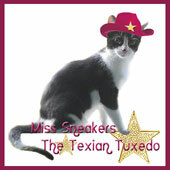 Sneakers the Texian Tuxedo here! With Elvira and Friday all tuckered out from thinking up and writing a couple of new 200 word cat stories to start the new year the job of posting our annual PSA fell to me. In case you are wondering why we STILL have not updated the PSA image in the years since Nikita's passing....it's because we haven't gotten the perfect pose from either myself or Elvira, much less young Friday, that's why! Hee, hee! Hope you got lots of nifty treats and presents from your humans, or at least plenty of extra belly rubs, and lap time. We have been getting the latter, hee, hee! I awoke this morning looking for a way to end this difficult year on a creative high note and found the inspiration in a new holiday piece by the Godfather of the Catblogosphere himself, Laurence Simon! His 100 Word Stories Podcast is, as he describes it, "the longest-running daily podcast of original material in the world." His work became not only a creative inspiration for Daddy Kiril, but for us, as well, beginning with Nikita. Our last 100 word story was in August 2014, and our last 200 word story was in June 2017 (See the archives in the sidebar). As for Daddy Kiril his last 100 Word Story was in 2013 and his last 200 Word Story was to celebrate New Year's 2017! Shame on all of us, I told him, this morning, after I wrote my latest...We can all do better than that! Good afternoon felinity assembled, Elvira Mistress of Felinity here. They call it Veterans Day. As Military.com explains it... "This holiday started as a day to reflect upon the heroism of those who died in our country's service and was originally called Armistice Day. It fell on Nov. 11 because that is the anniversary of the signing of the Armistice that ended World War I. However, in 1954, the holiday was changed to "Veterans Day" in order to account for all veterans in all wars. We celebrate and honor America's veterans for their patriotism, love of country and willingness to serve and sacrifice for the common good." There was a 4 year period, early last century when the humans got real mad at each other and took to shooting at each other to sort it all out. Lots of them died before they settled their squabble. It was messy to say the least, both the fighting and the peace that came afterward. I want Opinionated Pussycat to be among those who pay tribute to the unsung heroes of the war, and to other wars before and since. The army of animals... horses, donkeys, and mules, among others who gave their lives to serve their humans needs. Happy Sunday morning, felinity assembled! Elvira Mistress of Felinity, here, with some news. I apologize for the lack of content since the CWA Conference. We HAVE been going through what all he brought home and planning for some posts, but we have also been keeping an eye on Daddy through the Summer. He had a stress-related fainting spell at work, one evening and, while he had no need for a visit to the hospital, it had us worried. He also had something called a hemorrhoid that had him worried, and thus made us look at our own butts more closely for days! He has a new doctor and wants to get his first physical in 2 years, some bloodwork, and more, if he can, to better understand what physical shape he is in as he begins to bike and walk more now that he also has a more "personal life-friendly" work schedule, with a few day shifts and his days off all occurring on weekdays. Anyway, I also apologize for the inability to see photos, right now. There is a reason. One of his Domain Names has recently expired and he is unable to pay the renewal and reinstatement fees until payday on Thursday. What this means is that anything associated with that domain is unviewable until he pays the bill. Such is life when living paycheck to paycheck. The good news is that this payday is a doozy, he says, what with a huge 2nd quarter bonus that looks to allow him to put some money away in his savings once his bills are paid and he shops for some clothes and sets some money aside for a few vacation activities he has planned. Sneakers the Texian Tuxedo, here, on a mission of enlightenment. 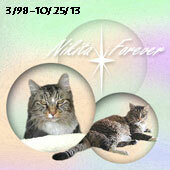 Our beloved founder, Mr. Nikita, was a clever, creative, feline...sometimes too clever, it appears, for some in our readership, especially the humans, hee, hee! As our fans know we have a few Special Pages dedicated to awards and praise sent our way over the years. Well, Nikita got this brilliant idea to take things a bit further, thru the use of humor and satire and, with the research help of Daddy Kiril, he created a "More Praise" page. The idea being to re-write famous quotes, famous publication slogans, famous comments and more, and rename the originators as well, all with a distinctly feline slant. We hoped that anyone coming across the page would be sufficiently amused that they would explore the blog, share something they liked elsewhere, and even return from time to time. We have no idea how many humans and critters have read or shared the page on social media, and no idea what they think since no comments have been left to the page or sent our way via email...until Daddy Kiril plugged the page on his Facebook yesterday. "I was reading some of your puns but don't understand most of them. Would you be able to add the names of the people you are satirizing using parentheses ( ) to make it easier for people to read and enjoy?" Well, we talked it over with daddy and decided that a blog post that the page could link to, with an explanatory invite to the confounded, would be best so as not to clutter up an already busy page. This is a post we can update, as needed, over time, as new entries are added to the page. 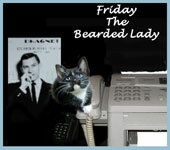 We cats drew straws to see who would do the blog post...I won and Elvira and Friday went off to take a nap, hee, hee! you have suggestions for us to work with in creating new entries, please either e-mail us, or leave a comment for us to find your suggestion. Good afternoon felinity assembled, Elvira Mistress of Felinity, here, and it is safe to come out now, the humans stopped celebrating the 4th of July around 1am this morning, hee, hee! It was a recording setting day for rain, yesterday, in Houston, as much as 8 inches in some places. While Daddy Kiril went to work, in the evening, Sneakers, Friday and I sat in the window watching what we could see of any fireworks going off. When daddy came home, around 130am, he had thoughtful look on his face and smiled when he saw us. To me this meant he had had some sort of creative inspiration and it must have involved cats. When he awoke, this morning, he fed us, took a bath, then ate breakfast while writing at his desk and crying as he watched 2 Youtube videos. Then he shared his work with us, for our thoughts, and then asked me to post the result while he got ready for work. let us swear to rescue and adopt into homes with you and me. raise our voices in a solemn prayer. God Bless the feline, critter I think the world of. Day and night showering her with love. My desk to the bathroom watch her roam. God Bless the feline in my home sweet home. Whatever floats yer boat, he says, hee, hee! Elvira Mistress of Felinity, here, and Sneakers, Friday and I recently have been doing our first product review in a very long time! As regulars know we are known for book and product reviews, from time to time, as publishers and sales reps discover our blog and think what we bring to the table makes it worth their reaching out to us, for whatever reason. Well, at the end of April a rep from KitNipBox reached out to Daddy Kiril and, after spending some time exploring their site, having daddy ask some questions for us, and then thinking about it, we decided to say yes to a free box to review. The first box sent us apparently got lost in the mail, but we eventually got a box and, after the CWA Conference daddy let us do our thing. 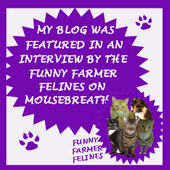 "I stumbled upon your blog and think it's pawsome! I'd love to send a complimentary KitNipBox for your kitties to play with in exchange for a review on your site + a link back to KitNipBox." He began this way..."how did you stumble upon their blog and what about it makes you consider it "pawsome"? 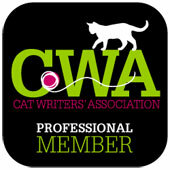 "Your blog IS pawsome! I realized that it wasn't very active when I first stumbled upon it, but I loved your (ahem... I mean, your cats') writing style. Not to mention, the name of your blog, Opinionated Pussycat, is just too purrfect! I know how awkward it can feel rejoining a community that you were once active in. We've all been there! Luckily, the cat community is so very warm and fun - I'm certain that your readership will continue to be strong and supportive! Regarding how I connected with your blog: I think I found it through a list of top cat bloggers somewhere on the internet - not sure which list - but you're definitely listed somewhere! All that said, I'm thrilled to hear that you and your kitty crew are happy to write a review about us!" We received this product in exchange for our and Daddy Kiril's honest review and no compensation other than the product was given to us.